I was initially intrigued by the brands aim to create a nature inspired and science driven product that is simple yet effective. (I mean what a great combination! WHOOP WHOOP!) Their products also make it a point to make sure that they are not tested on animals. (So you can give your furry little friend a fist bump for this WIN of a brand.) It's also packaged in glass making it easily recyclable and environmentally friendly. It also help preserve the ingredients of the products are in the best condition possible, making it great for your skin too! If I have peaked your interest with this gem, Juva Skincare is having a great giveaway on their website. In order to celebrate their 3rd month of being in Australia! Moving onto the Brightening Enhancer* which for me is probably my least fave of the range. For me sprays are a bit of a luxury product. So this enhancer is a refreshing boost that I like to add just before I put on my makeup. This is probably the product I would take a miss on if you're not a big facial mist fan but it is great for boost in the morning, (especially when I want my skin to be a bit more pepped up for the day.) It's also great for those annoying monthly skin days, and I do adore the frosted bottle packaging. While, the Brightening Lotion* is actually a product that I thought would be great for my night time routine. Unfortunately, it's not thick enough. However, it does work as a great day time moisturiser. It has gel formula that is moisturising and has a matte like finish. (But not completely matte that it dries me out.) It also comes in a pump making the product easy to dispense, and the fact that it is in a glass bottle gives it a great luxury feel. In terms of a brightening range, does this product actually work? At the time of trying this range out. I was quite dark and tan from the past summer. So YES, for me this did work! It illuminated my skin and did make it look and feel more brighter. If I were to recommend 1 product, I would highly suggest the Brightening Essence. It's not too light and heavy making it great for all skin types and for me, it made the most difference when it came to brightening my skin. 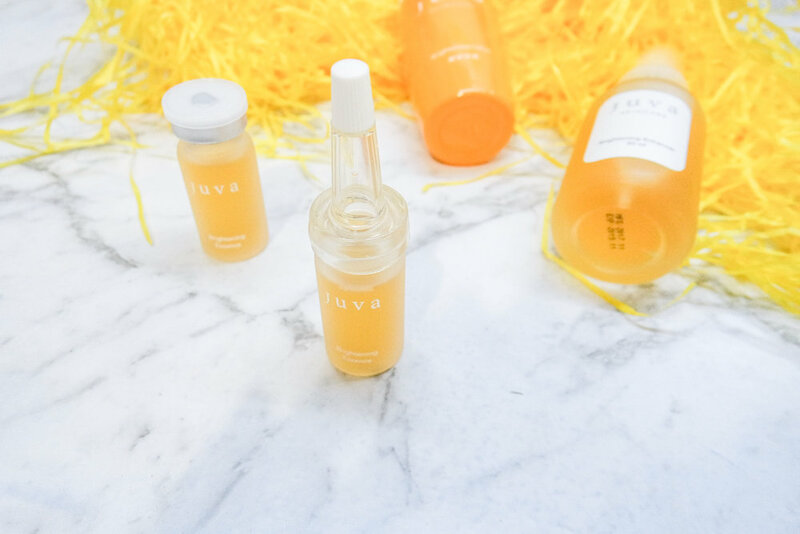 Let me know in the comments what you thought of my Juva Skincare review and which one you are keen to try out.